Congratulations to Sarah Carmody, M.S., CCC-SLP, for graduating from the Apraxia Kids Intensive Training Institute (Apraxia Boot Camp)! Sarah Carmody is a speech-language pathologist based in southern New Jersey and affiliated with the Nemours Alfred I du Pont Hospital for Children (Deptford satellite). She loves languages, and was first fascinated by motor speech while enrolled in a course to improve her pronunciation of French. This experience led Sarah to her role as an SLP and multilingual specialist, serving in pediatric outpatient therapy settings. She also operates a small private practice and collaborates regularly with school districts. Sarah developed a specialty interest in the assessment and treatment of CAS through her experiences at Apraxia Kids National Conferences, and alongside several children and families who have invited her on their speech therapy journey. 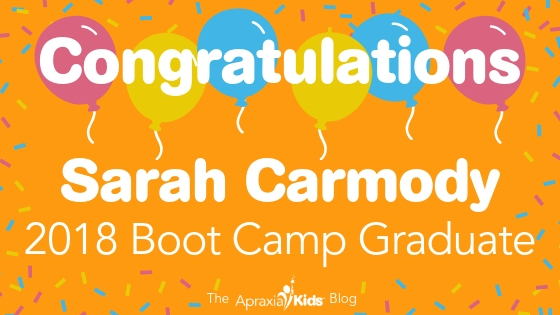 Sarah is a proud graduate of the 2018 Apraxia Kids Intensive Training Institute aka “Boot Camp!” She is committed to using this specialty knowledge to help children find their voices, support families, build professional collaboration, and spread community awareness of childhood motor speech challenges. Sarah holds her MS in speech-language pathology from Teachers College, Columbia University and a B.A. in History and French from Boston College. Apraxia Kids: If you were to state the #1 thing you learned from this training experience, what would that be? Sarah: I think my number one takeaway was that a strong, data-driven approach to assessment and treatment that is founded in the most current research based understanding of CAS (diagnosis/treatment) will lead me to make more confident and clinically sound decisions in practice. When I make decisions that are clinically sound I am better positioned to explain them to caregivers, professionals, and key players in a child CAS journey. Apraxia Kids: Tell us about any relationships that you formed through the training experience. Apraxia Kids: Have you served as a local resource/information source for other professionals and families since attending the intensive training? Apraxia Kids: What would you say to someone considering applying to boot camp next year? Sarah: I would tell them that, no matter how much you think you may know, this is likely to be the first step on a very intense but incredibly worthwhile learning journey. Not only did I expand my knowledge tremendously at the training, but it has brought me to an entirely different level of understanding, seeking, and exploring information as part of the clinical dialogue related to motor speech. Do it!